Did you have a chance to check out the Ocean Alexander 120? We took an up-close look at this award-winning yacht, a collaboration between two boatbuilders who understand the needs of their clients. Take two boatbuilders serving different markets and let them each play to their strengths in a single project. Chris Caswell takes a look at what you get with the new Ocean Alexander 120. Collaborations are nothing new in the business world, and the focusing of two minds on a project often results in remarkable achievements. Think of Messrs. Rolls and Royce, for example. Pratt and Whitney. Proctor and Gamble. Even Ben and Jerry. 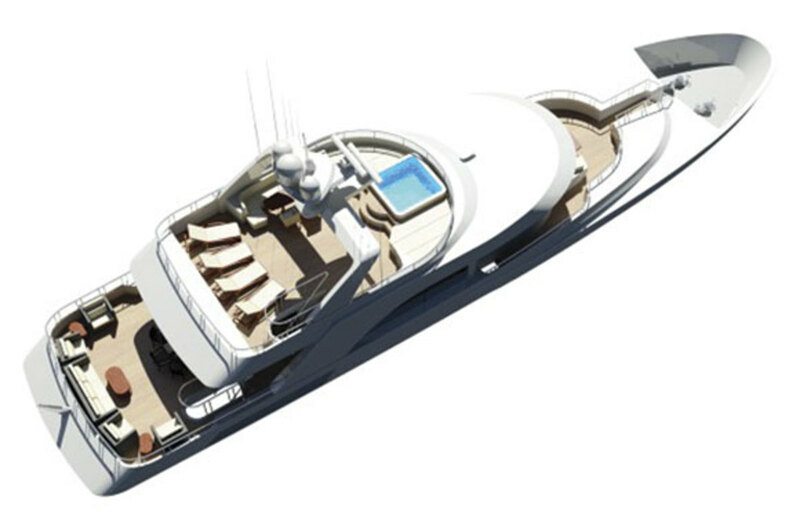 The new Ocean Alexander 120, though marketed under the Ocean Alexander name, is a collaboration that came from out-of-the-box thinking by two major boatbuilders, and the result is nothing short of spectacular. 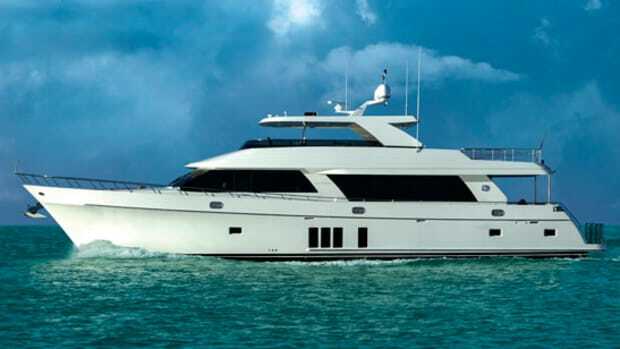 Ocean Alexander, whose primary market has been yachts between 60 and 80 feet (though they’ve built a 100-footer), was interested in a yacht in the 115- to 120-foot range. Richard Allender, the director of Ocean Alexander’s U.S. operations, could see the impact of the economic downturn and approached OA owner Johnny Chueh with a proposal—team up with a company already building large yachts rather than starting from scratch on their own. Allender first needed a designer who had experience in large yachts and who could bring a fresh look to this largest-ever Ocean Alexander, and he settled on Evan K. Marshall, an American designer based in London who had a good feel for both American and European sensibilities. 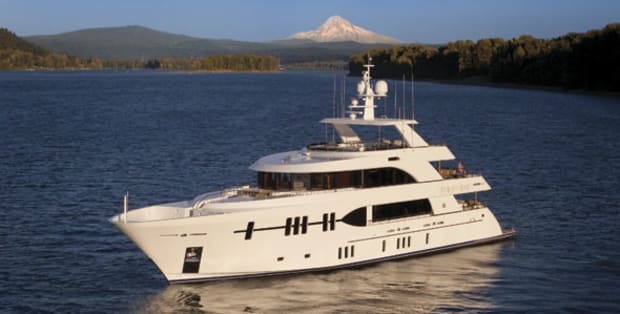 Next Allender considered a number of builders and it became clear that Christensen Shipyards, the composite megayacht builder not far from the Ocean Alexander offices in Seattle, would be ideal. The collaboration worked both ways, and both companies came away with expanded knowledge: Ocean Alexander learned about innovative exhaust systems, and Christensen benefited from OA’s weight-saving technologies. There was another plus that lay behind the collaboration for buyers of the Ocean Alexander 120: the charter benefits of a U.S.-built yacht. In an economy that strains the finances of even the wealthiest yacht owners, the ability to offset costs with charters is a major appeal, and something not available to Ocean Alexanders built in Taiwan. 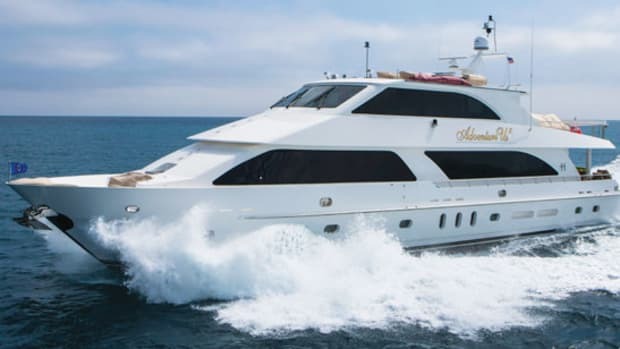 The new 120, however, is built to ABS (American Bureau of Shipping) classification and MCA (Marine and Coastguard Agency) rules, so she can charter worldwide with no constraints (see “Better Boat: The ABCs of Classification,” here). 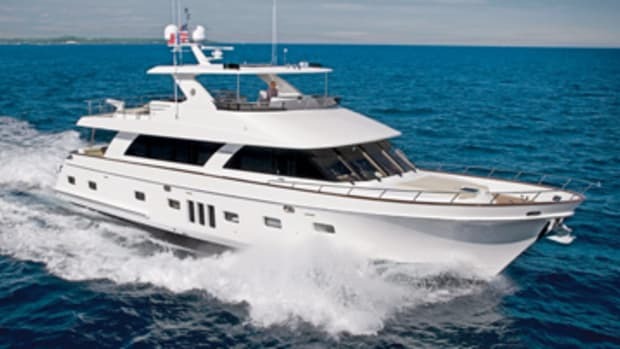 It’s clear that Marshall had chartering in mind when he arranged the 120, starting with a distinctive trideck styling that includes a spacious main-deck master suite plus four large staterooms on the accommodations level and ending with dedicated stowage areas for guest luggage. Marshall’s interior draws styling cues from both Ocean Alexander and Christensen to create a clean and contemporary décor that is notable for a high level of craftsmanship. Combining the burled woods of Ocean Alexander with the exquisite marble and granite stonework of Christensen makes the Ocean Alexander 120 a contender with any yacht in the world. The exterior profile is notable for the high sheerline that runs from the bow aft to become bulwarks around the pilothouse and skylounge. 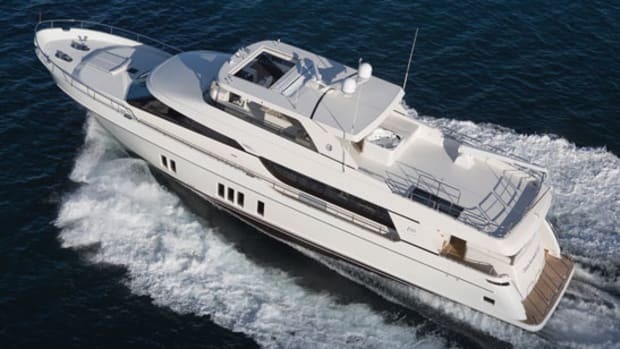 This gives the 120 a take-no-prisoners seaworthiness and also allows the master suite to take full advantage of the 25-foot beam. The master suite is fit for royalty, with a centerline berth, a comfortable sitting area with a sofa, an expansive desk/vanity, and two oversized hanging lockers. His-and-hers heads are forward and also span the full beam, separated by an oversized shower and a whirlpool tub, all accented by the intricate Christensen marblework. Marshall created a distinctive exterior look by using vertical windows and portlights, and all the guest areas benefit from these large windows that allow both a view and natural lighting. A private stairwell near the saloon leads to a foyer on the lower deck, again notable for inlaid marble, that is fitted with a mini-pantry to serve guests. Aft are two mirrored VIP staterooms with queen berths facing inboard, with beautifully appointed en suite heads lined with marble that feature crystal vessel sinks and fixtures befitting a five-star hotel. Each of the guest cabins is individually decorated, with distinctive stonework, joinery, and color schemes. Though the VIP staterooms back up to the engine room, exceptional attention to insulation combined with floating floors keeps the decibels to a whisper, measuring at the same level as a 165-foot Christensen megayacht. 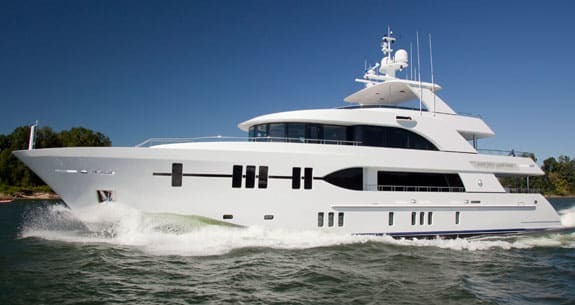 The main deck has an openness that makes her seem far larger than 120 feet, starting with a marble-lined entry through electrically operated curved sliding doors from the afterdeck. A seating area with couch and chairs faces a pop-up TV to starboard, and the entire saloon is lined with full-height windows that bring in light and offer good views. The formal dining area is forward and, in a clever design touch, offset to port to create an unblocked passage fore and aft. The magnificent hand-crafted dining table seats 12 atop a marble sole for easy maintenance, and cabinets of black walnut and maple hide china, crystal, and silver behind frosted art deco doors. A sliding door in one corner allows seamless service from the galley just forward. That galley was clearly designed by someone with either chef or restaurant experience, because it has been laid out intelligently for access to all appliances with the least steps. A granite counter divides the galley, putting the chef to one side with space for servers to prep without intruding. A Liebherr stainless steel fridge with drawers is backed up by a freestanding Liebherr freezer, and the chef has a 36-inch Dacor wall oven plus a five-burner Dacor cooktop to handle any dining need. Other amenities include a stainless steel microwave, Asko dishwasher, and glass-front wine cooler. The galley also includes a large dinette with table next to oversized portlights, creating an airy country galley for use by guests who want to participate in the cooking process. This is a touch aimed at North American owners or charter clients, rather than Europeans who prefer their galleys to be neither seen nor heard. The skylounge on the upper deck has the feel of a private club, with burled cabinetry, art deco frosted doors, and, like the saloon, full-height windows. A variety of needs are addressed by a wraparound couch, a midroom chaise, a hidden wet bar, and a game table for four. Rather than the usual pop-up version, the TV is concealed behind artwork on the after bulkhead. An oversized dayhead is just forward. There’s no shortage of alfresco seating on the 120, with dining tables on both the main and bridge afterdecks, each of which is protected by overhangs. Just forward of the pilothouse is another seating area that wraps around a table that would be pleasant when at anchor. And, of course, the sundeck has another alfresco dining table as well as room for several sun lounges, and the large whirlpool spa forward has built in sunpads on each side behind a low venturi windscreen. This still leaves ample space aft for a hidden davit and deck space large enough for several personal watercraft or watertoys. 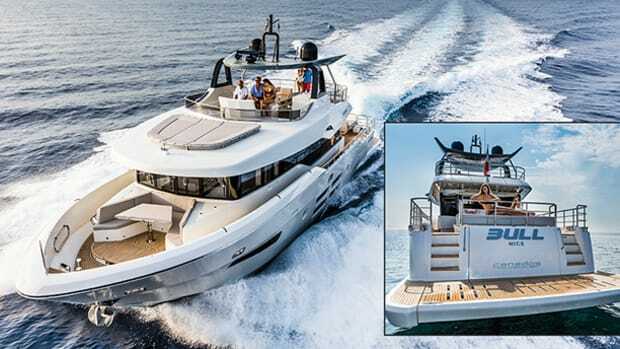 Because the yacht was designed for an international audience, there is no helm on the top deck, since Europeans prefer privacy to work on their all-over tans. 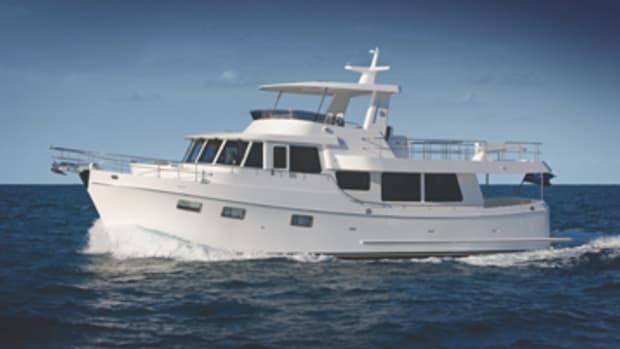 The pilothouse is seemingly transplanted from a much larger yacht, with a wraparound dashboard holding five monitors, chart tables to port and starboard, and a pair of Stidd pedestal chairs behind the wheel. Just aft, a center island has a leather settee with table for guests to enjoy the operations and, tucked into the after bulkhead, is a compact ship’s office. That settee-island isn’t just for guest comfort, though: It allows full-sized flat chart stowage underneath. The captain has his own cabin just abaft the pilothouse, with a double berth and private head with shower. 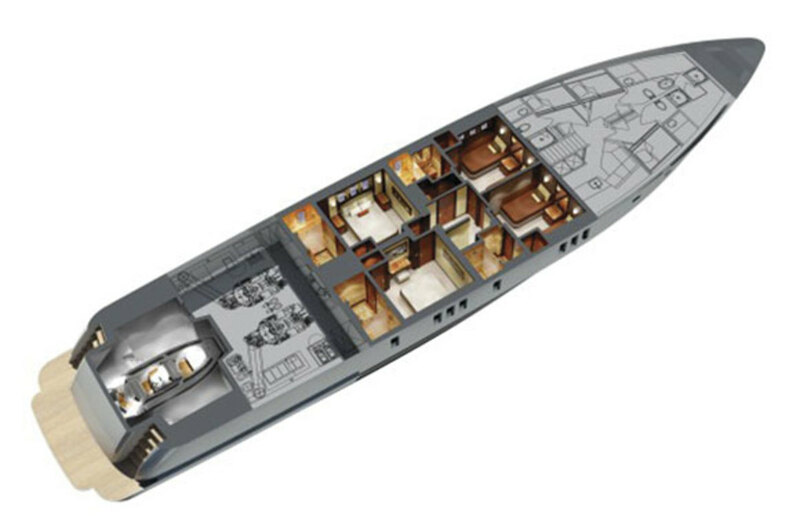 The Ocean Alexander 120 is likely to have a very happy crew, too, since the crew’s quarters for six are forward in three private double cabins, each with its own head with shower. The area also has a crew mess, mini-galley, dual stacked washers and dryers, and a hidden access door to the lower deck guest cabins to make service that much easier for the crew. 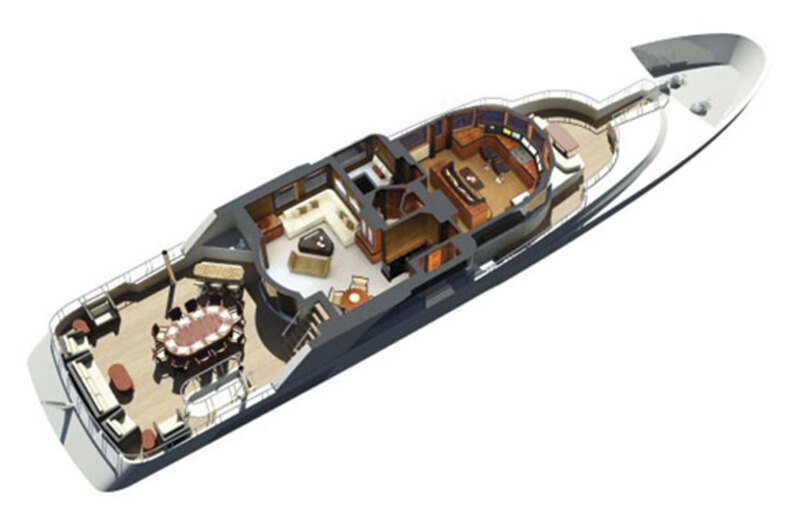 Along with considering the potential “charterability” of the Ocean Alexander 120, the designer and builders also made an effort to create a yacht that will be economical to operate. The power is provided by a pair of MTU 12V 2000 engines that have been detuned to about 1,450 horsepower each, which allows them 12,000 hours between overhauls, or twice the service hours of more powerful engines. This gives the 120 a transoceanic cruising speed of 11 to 12 knots but, because the engines have a continuous-duty rating, the yacht can run all day at 16 knots without concerns. The engine room is one area where this is clearly a Christensen, and the piping, plumbing, and electrical systems obviously share the same pedigree of much larger Christensen megayachts. 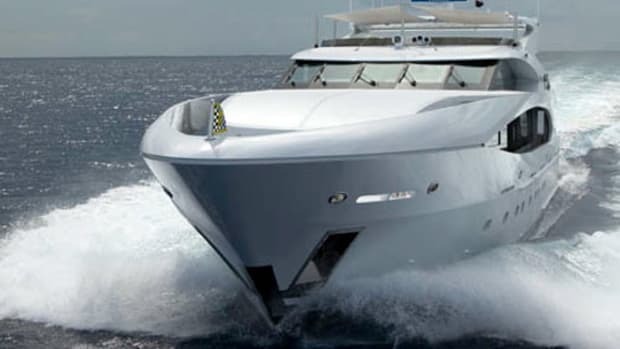 Because the yacht is fitted with ABT/Arcturus digital stabilizers that have “at-rest” stabilization, the yacht was equipped with twin Caterpillar C4.4 generators of 76 kilowatts each. That’s more power than would normally be needed, but it allows the yacht to run just one generator at night and still have all systems, including the at-rest stabilizers, on line. 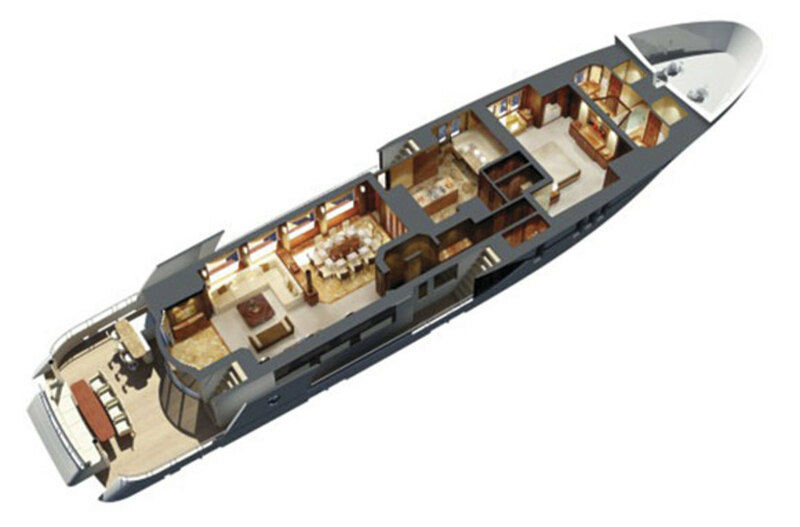 The engine room’s after bulkhead has a largish “dent,” and this allows a garage in the stern that will hold a diesel tender up to 15 feet long on a railed launching system—hidden tenders seem to be a preference for European clients. When not in use, the garage becomes a teak-lined beach at water level. 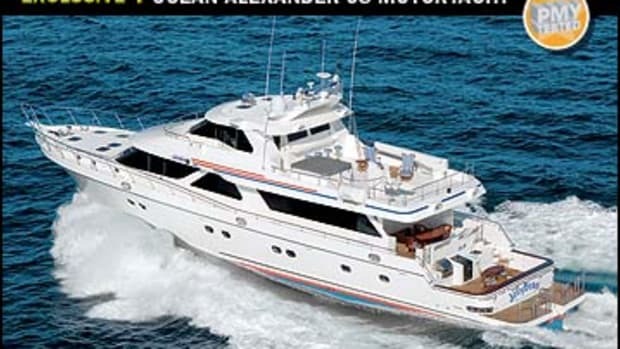 It’s hard to explore the Ocean Alexander 120 and not keep thinking, This has to be larger than a 120-footer. It’s a tribute to everyone involved, builders and designer alike, that the airiness and space create a feeling of opulence and privacy that is usually the province of much larger yachts. With both Johnny Chueh of Ocean Alexander and Joe Foggia of Christensen pleased with this first collaboration, there are sure to be more. Like all Christensen hull molds, those for the OA 120 are adjustable and there are already plans for 135- and 155-footers, which could also use some of the superstructure tooling. This gives great flexibility, and allows the builder to restyle these yachts in the future. The first Ocean Alexander 120 has proven to be exceptional enough to win awards and, though an extremely successful collaboration with Christensen, future yachts will remain under the Ocean Alexander nameplate. Sorry, there’s not likely to be a “Johnny and Joe” version. 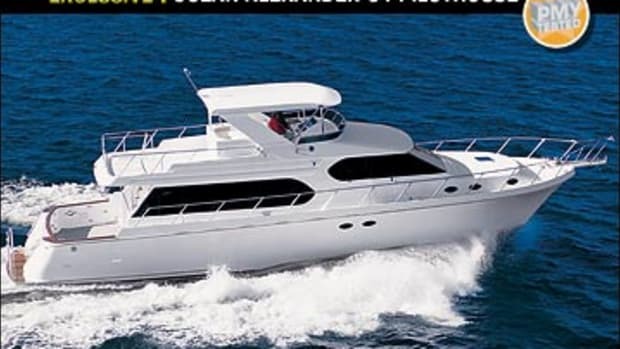 Click to see listings of Ocean Alexander Yachts currently for sale on BoatQuest.com. This article originally appeared in the April 2013 issue of Power & Motoryacht magazine.